The photographer gets the tables turned on him. Most years in late September or early October, you can find me at least one long weekend up in the Eastern Sierra along Highway 395 between Bishop and June Lake Loop for fall color. That part of the Eastern Sierra is full of alpine lakes and creeks running down from the Sierras into the valley below. 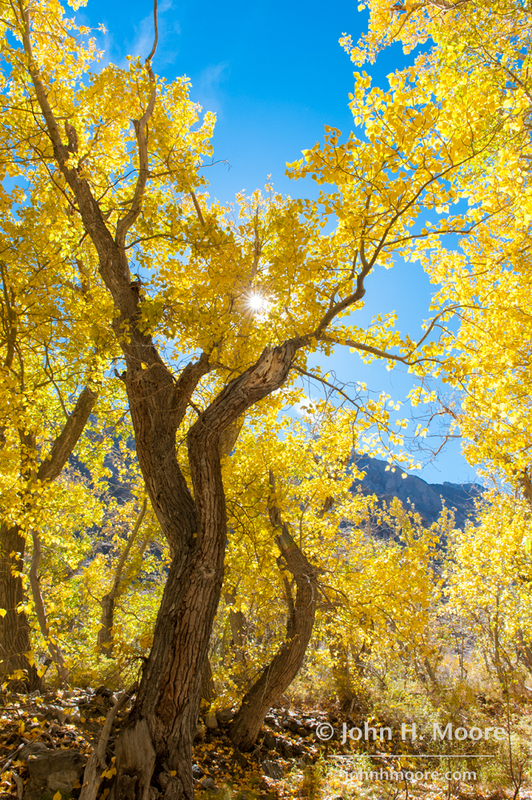 The lakes and creeks tend to be surrounded by aspen trees whose leaves turn the most lovely yellows and oranges in fall. In recent years, my two younger daughters have come along… and it’s getting to be more and more of a battle between my middle daughter and me for the camera. The girl needs her own camera, I think! 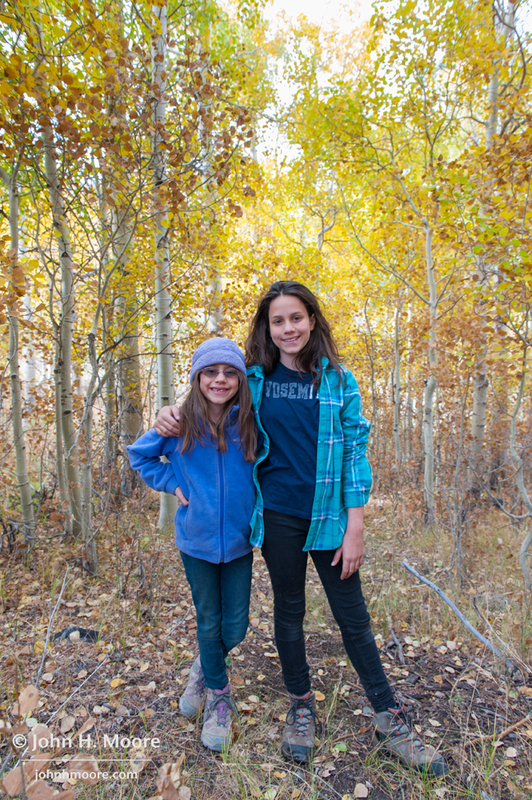 My younger daughters enjoy a walk in the woods near Bishop Creek. This year, conditions at higher elevations were beautifully at peak color and we were all set to head up the last couple days of September, but a final weather forecast check the night before showed nightly wind gusts in the 30-40 MPH range for the long weekend. I don’t know if you’ve ever camped in high winds, but it is not fun! So we delayed a week and prayed that the winds wouldn’t strip all the leaves that had already turned color off the trees. 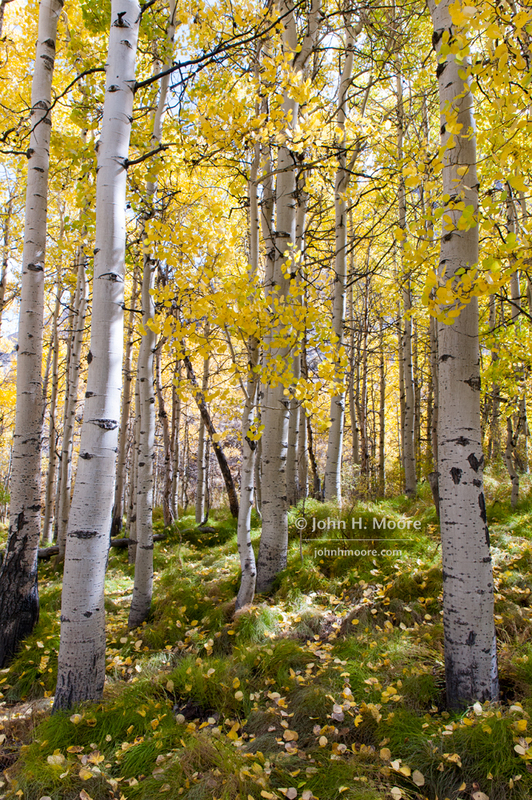 As we found out a week later, the winds had come that weekend and all the aspens at higher elevation were bare. Conditions at middle elevations were a weird mix… a few spots had great color, some spots were past peak with burnt oranges and yellows, and much hadn’t turned yet at all. 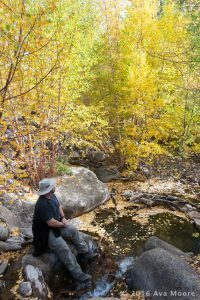 In our time there, we explored both forks of Bishop Creek (and all three lakes) plus McGee Creek. 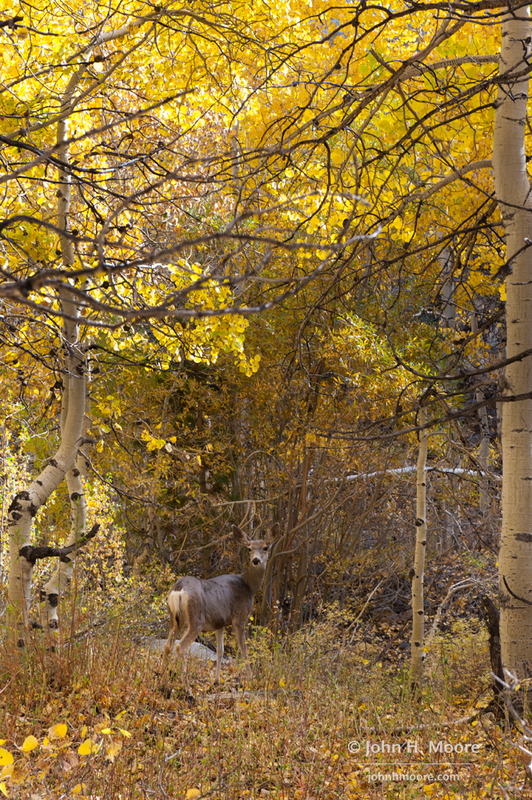 We didn’t make it up to June Lake Loop, but my guess from the creeks closer to Mammoth is that it might have been nice. Below are some of my better shots from this Mother Nature-challenged year. Grove of aspens in different stages of color around Mist Falls on the South Fork of Bishop Creek. 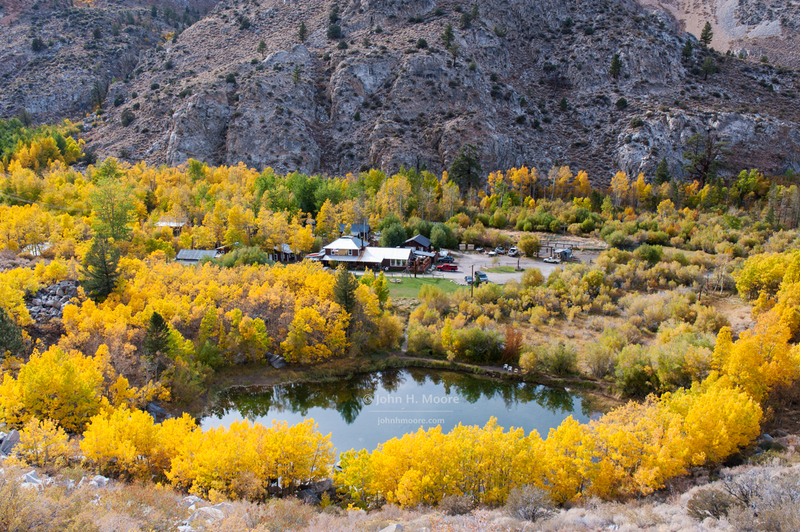 View of Cardinal Village Resort in Aspendell, California, from Highway 168 up to Lake Sabrina. 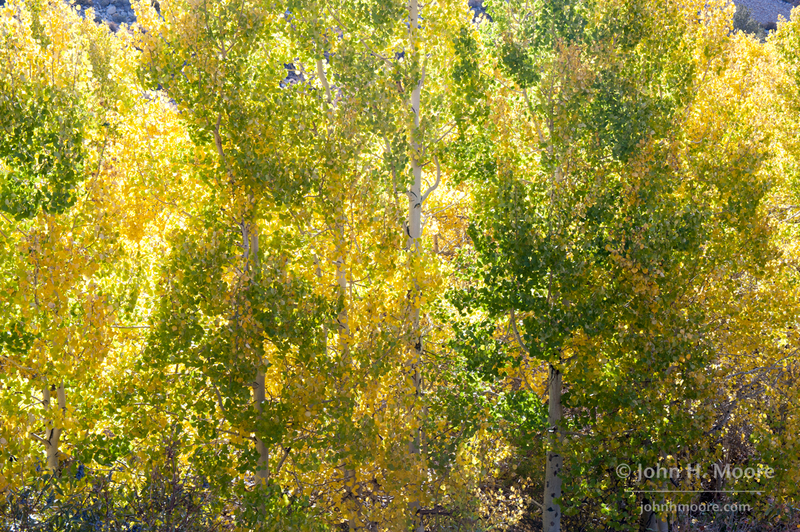 Mixed yellows and greens in a stand of aspens just turning color. 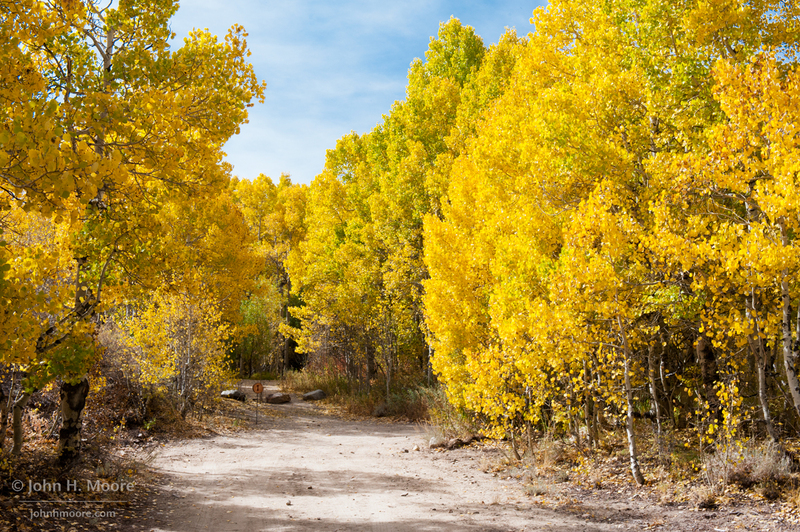 A road in the autumn woods near Cardinal Village Resort in Aspendell. 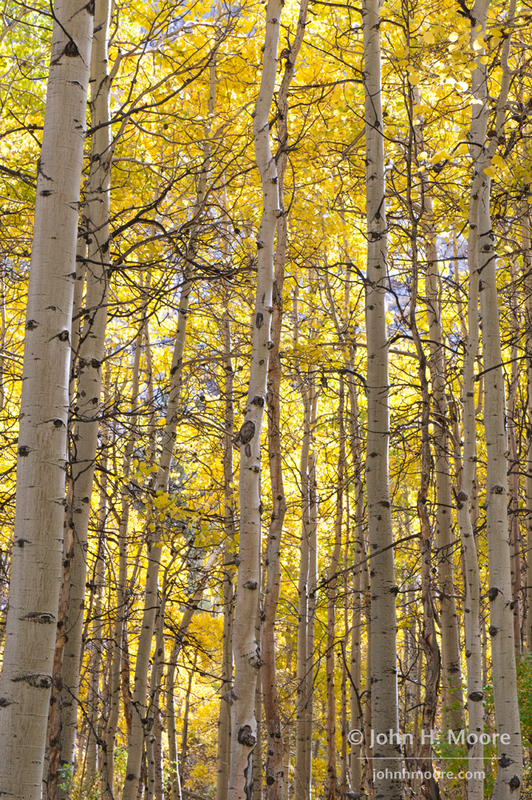 A sunny glade of aspens in fall. Fall color along McGee Creek. 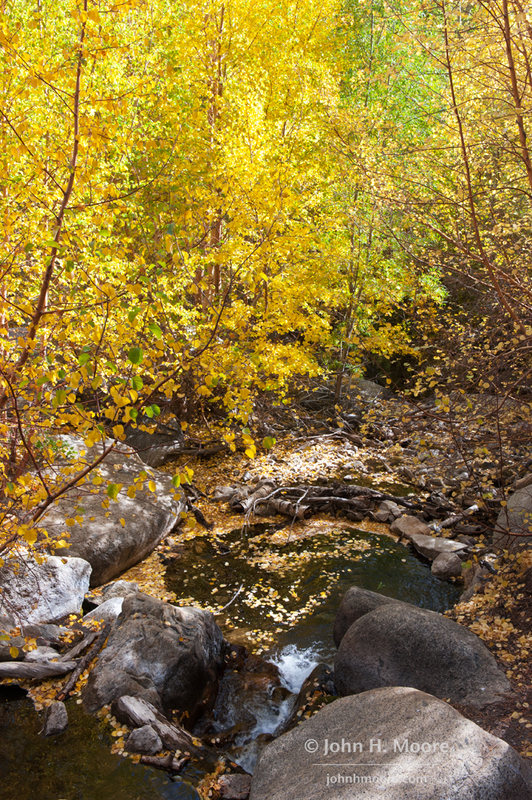 Fall leaves swirl in a small pool in a creek near Aspendell. 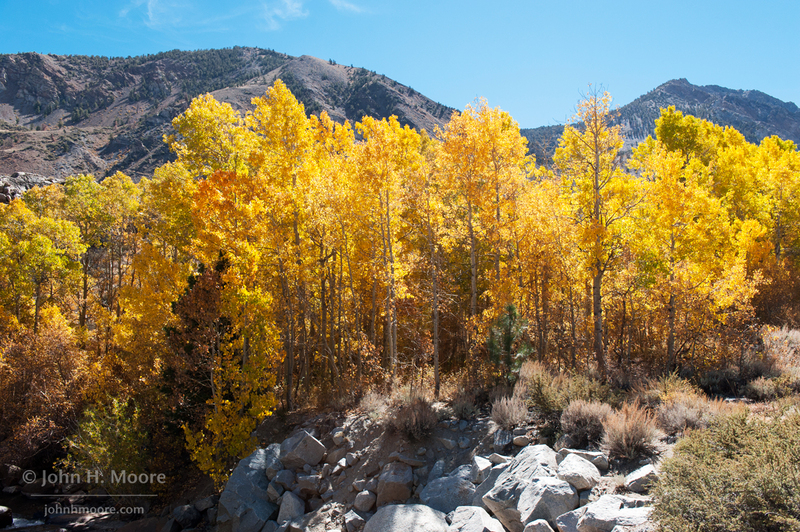 Fall color in the Eastern Sierra at McGee Creek. 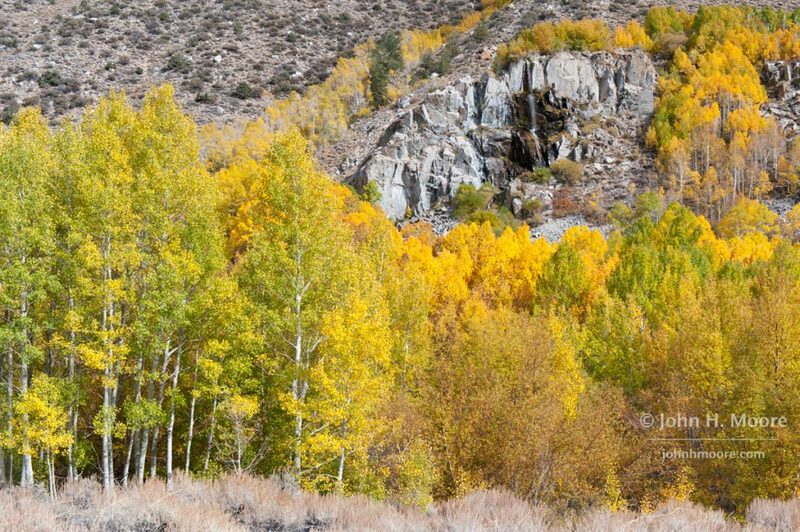 Fall color in the Eastern Sierra near Aspendell. 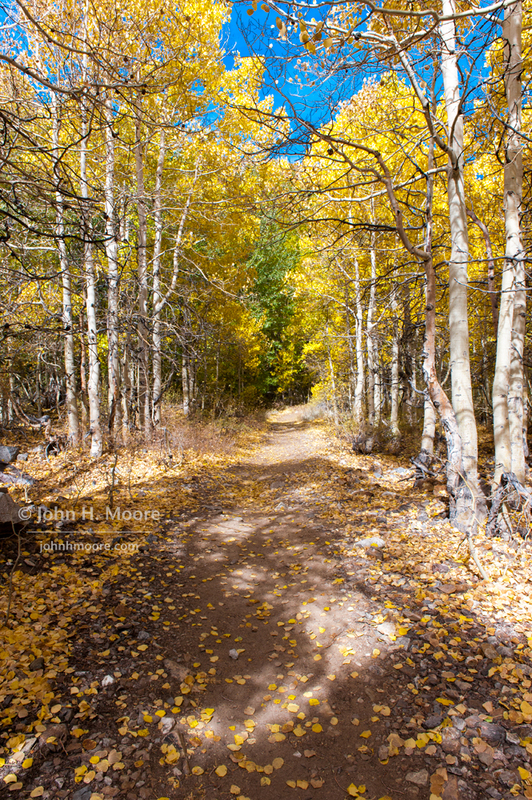 A path in autumn woods. A deer in the woods along a the walking path at Carindal Village Resort in Aspendell. 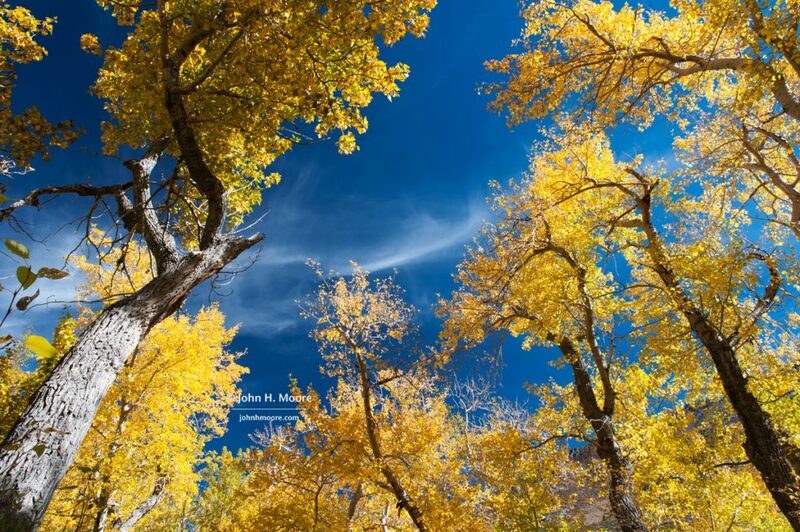 Aspens in fall. 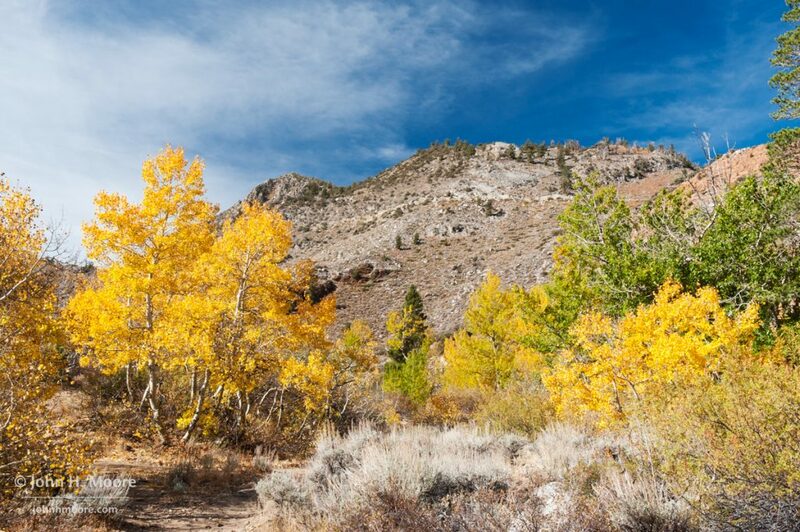 Eastern Sierras. 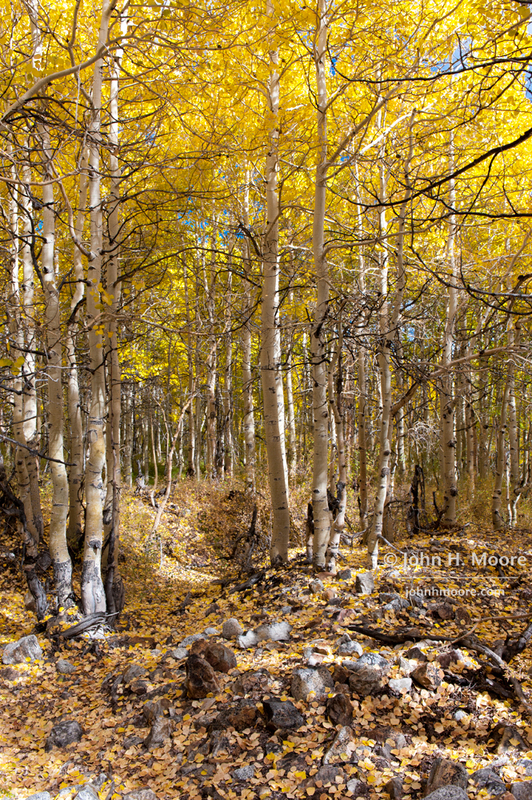 Aspens turn color along Bishop Creek. 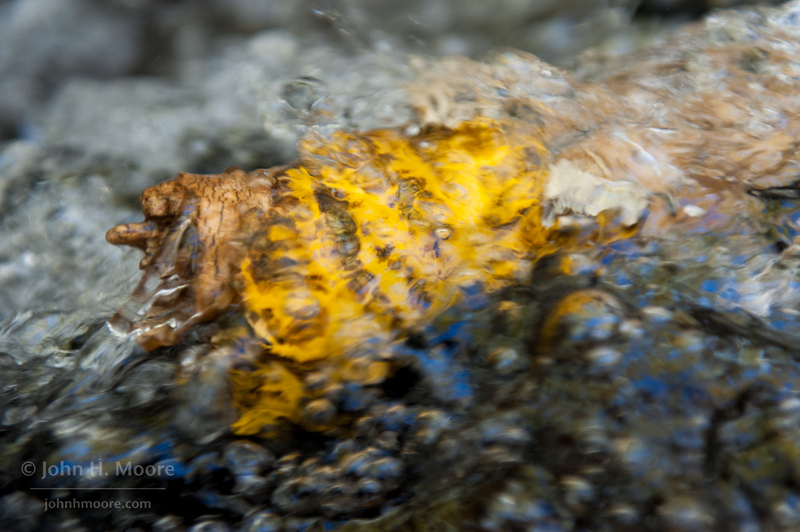 A yellow leaf stuck on a stick along some rapids in McGee Creek. 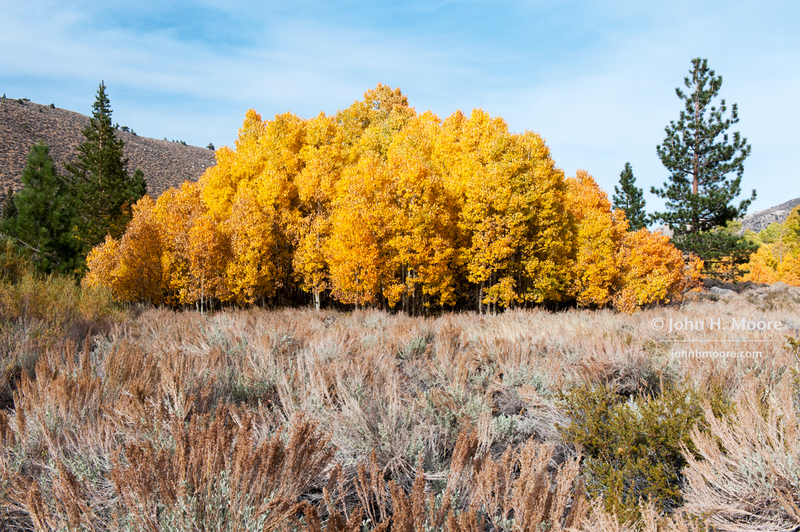 A small grove of just-past-peek aspens, all in orange, just outside of Aspendell. This entry was posted on October 16, 2016. It was filed under Uncategorized.